You won’t ever need to close your eyes to be transferred to your dream place! With this mosaic artwork, you’ll have it right in front of you, when enjoying your glass of wine after a long day. 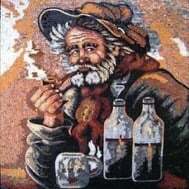 PROs: Handmade mosaic artwork composed of high-end glass tiles that is guaranteed to transform your space. Mosaicist: Haith D.
CONs: Fine, you can pick your favorite people to have a glass of wine with.